Above: Rammed-earth walls and a glorious picture window help bring the outside in. YOU ARE ALMOST UPON PETER AND MARIA SELZER&apos;S HOUSE before you notice it, tucked down into the rocky landscape on the edge of a river canyon at the southwest end of Taos. The building so harmonizes with the environment that coyote tracks speckle the patio the snowy day I visit. A bobcat frequently visits, too, and Peter recently spotted a bighorn ram outside the floor-to-ceiling great-room windows. The ram had the right idea. This beautiful U-shaped house is cozy even on the bleakest winter day, designed in a contemporary, streamlined style but still reflecting traditional local culture and aesthetics. The central rammed-earth section is the heart of the home, with a main living area and kitchen, topped by a Territorial-style pitched roof. Peter, a part-time radiologist at Holy Cross Hospital in Taos, and Maria, his Italian-born wife, spend most of their time here. Let’s not forget Jade the parrot, an active participant in our conversation. 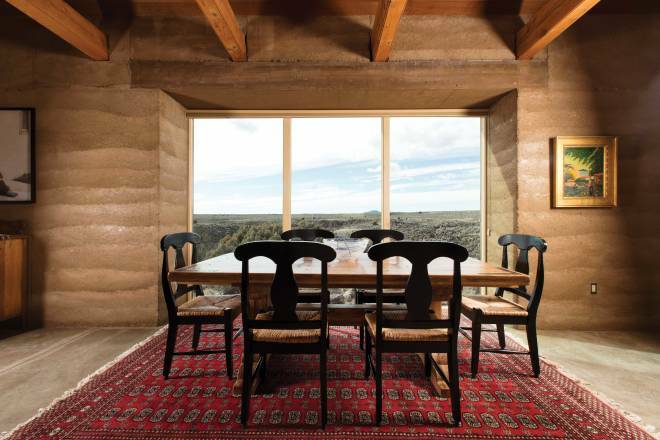 One side of the open-plan great room and kitchen looks to the western horizon over the Río Pueblo, running through the canyon below, the other onto the courtyard and the Sangre de Cristo Mountains beyond. Maria’s idea of a perfect day is relaxing in the kitchen, enjoying the views on both sides. “Grab a good glass of Cabernet and read cookbooks!” She has hundreds to choose from. Two updated Pueblo-style wings wrap around the courtyard, constructed of Pumice-Crete and fronted by portals. The bedroom wing enjoys views toward Taos Mountain. Throughout the house, large expanses of glass create an indoor/outdoor illusion. Peter fell for Taos when he visited to ski in 1990. “It was not just a ski town, but a real place that happens to have world-class skiing nearby. I bought land in case I ever wanted to move here.” He later married Maria, and asked a ski buddy, San Francisco architect Nick Noyes, to design the house. Noyes says he had relatives in Santa Fe who “had a beautiful old adobe that John Gaw Meem had worked on, so I had a sense of the soul of all this before we started. Construction ran from 2005 to 2007, emphasizing sustainable and alternative building technologies in keeping with the spirit of Taos. “It was a virgin piece of land on a river gorge across from pueblo land,” Noyes says. “I felt like … I can’t blow it! You have to respect that country. Can we settle the house into the landscape as much as possible, low-slung, breaking down the house mass as much as possible?” Hence the unusual choice of three wings with different looks, all evoking traditional New Mexico architecture. Builder Ian Forsberg recommended Boulder’s Martin Mosko to design the xeriscaped courtyard. A landscape architect and abbot of a Zen Buddhist temple, Mosko had built gardens for, among others, the Dalai Lama. His Japanese influence shows in the courtyard’s wandering pathways and bridges across ponds filled with water lilies, koi fish, and waterfalls. Mosko called the project “Dragon’s Cosmic Breath.” Rock formations suggest a dragon undulating through blue flowers (water), with red flowers (fire) spilling from his mouth. A mosaic along a wall that frames the Sangre de Cristos symbolizes the earth, from the garden soil up through snowcapped mountains to the sky. Regular contributor Tania Casselle is a Londoner who fell in love with Taos—and a Taos man—on her first road trip in New Mexico.